Rev up your engine and join the trick show riders in Nitro Circus. This 5 reel, 25 payline video slot comes from Yggdrasil Gaming and is based on the famous stunt bike collective. Superbly designed, it comes with plenty of extras including up to 60 free spins and a Nitro Jump which awards coin prizes, multiplier and even more free spins. Play on your PC, tablet or mobile from between 10p and £125 per spin. Yggdrasil Gaming video slots are usually well designed and that’s definitely true of Nitro Circus which looks and sounds superb. The action takes place against floodlights and a set of giant ramps. On the reels you’ll find 3 lower value helmets and 4 higher value character symbols. Top of the payers is Travis. Land 3, 4 or 5 of him on a payline and you’ll receive an award of 5, 10 or 20 times your bet. There’s also a wild that replaces all other symbols bar the bonus bomb. There’s a good selection of extras on offer in Nitro Circus. Nitro Blast feature – this is triggered by landing 2 of the bomb symbol on the same spin. You’ll then play a mini pick me round. Choose from the 5 bombs. You’ll then win between 10 and 30 free spins or a Nitro Wild that turns between 2 and 9 symbols wild. You could also get a step closer to landing the Nitro Jump feature by being awarded a vehicle for the meter. Land the Nitro Blast during the free spins round and you could get extra free spins or multipliers too. Nitro Free Spins feature – 10, 20 or 30 free spins are on offer if you land 3, 4 or 5 of the Nitro Bomb on the same spin. You can also look forward to 1, 2 or 3 feature picks which award extra free spins, multipliers or added wilds. Nitro Jump feature – there are 2 ways to trigger this round. Land the letters that spell the word NITRO or fill a vehicle meter to the side of the reels. You’ll then make a Nitro Circus style jump. Perform 3 stunt jumps which award coin wins, free spins or multipliers. On the final Nitro Boost jump, the aim is for your rider to get as far as he can while successfully landing a jump. The further he goes, the bigger the multiplier prizes. You can increase your speed and try and get further. This could bring a bigger prize but it could also cause a crash. If that happens, no prize is awarded. Games aimed at petrol heads haven’t really done it for us. 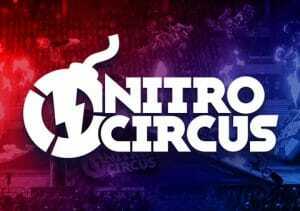 Nitro Circus is definitely one of the better ones in this genre though. The visuals are excellent and the rock heavy soundtrack, complete with the roaring crowd works very well. The features here are a little unusual so we suggest a few spins in free play mode before investing your hard earned. Those features are pretty good as it goes and deliver plenty of variety. If you like video slots that combine high spec design, a good selection of bonus features and the wild motor sport theme, then we recommend revving up with the Nitro Circus. I also suggest you try other Yggdrasil Gaming titles with Vikings Go To Hell and Wolf Hunters recommended.